DRO: How should the Reds use Michael Lorenzen in 2018? This week’s respondents are Nick Carrington, Chad Dotson, Chris Garber, Bill Lack and Steve Mancuso. Our Daily Reds Obsession: How should the Reds use Michael Lorenzen in 2018? Nick: I have beat the drum for Lorenzen to start for a while now, and I still think he would be a solid Major League starter if given the chance. However, I’m not blindly devoted to the idea. Lorenzen was terrible the last 2.5 months of the season and spent way too much time fiddling with his mechanics, something that didn’t seem out of place while he was dominating for roughly 100 innings between 2016 and the first half of 2017. If I’m the Reds, I let him start in Spring Training and see what it looks like. If his 2016 command returns, I give him two months to prove he’s a starter, knowing that he will likely need to transition back to the bullpen at some point because of an innings limit. If he’s still wild in and out of the zone, I put him in the pen. Chad: Is there any argument against giving Lorenzen an opportunity to start games beginning with spring training next year? Seriously, I can’t think of any good argument against it (unless, of course, the Reds have medical records that indicate Lorenzen physically cannot start). Lorenzen wants to start. He’s started 21 games in the big leagues, so it’s not like it’s a completely new concept. A good starter is more valuable than a good reliever. And Lorenzen will only be 26 years old next season. Chris: 110 innings out of the bullpen, assuming he gets his game together. If there’s a close game and the starter is flagging, just put Lorenzen in until he runs out of gas. Bill: I think the default for anyone with the possible capability of doing it is to attempt to make him a starter. It’s a lot easier to turn a starter into a reliever than the opposite. This team didn’t answer a lot of questions in ‘16 about their starters, so some slots are still open. Also, his athleticism and ability to hit could be used more effectively if he was in the starting rotation. His drop-off in the second half of ‘17 is really troubling though. He appears to have just become a lot more hittable for some reason. Hopefully that’s something mechanical that can be corrected or a matter of location, which might improve with experience and maturity. 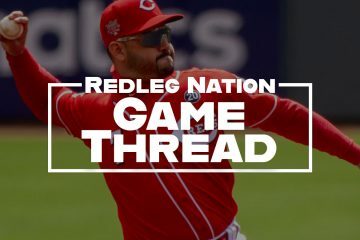 Steve: I put Lorenzen in the same pile of pitchers as Robert Stephenson, Cody Reed, Sal Romano, Amir Garrett, Brandon Finnegan and Tyler Mahle as worthy of a good look as a starter. I’d slot Lorenzen into the rotation for April and May and let him know, for innings reasons and to give others their opportunity, that he’ll move to the bullpen in June. If the Reds have traded Raisel Iglesias, Lorenzen would be a top candidate for closing games. I don’t put much stock in the “Lorenzen crashed in the second half of 2017” concern. Lorenzen had a better strikeout rate and lower walk rate in the second half. When you factor out the BABIP and home run luck, it turns out he was better in the second half. Don’t believe me? His xFIP was 3.60 in the second half and 4.12 in the first. Either way, the sample size is small. I’m still strongly in Lorenzen’s corner. Give him a solid shot in the rotation to see what he can do. I don’t think this is even really a debate. Lorenzen can barely handle a full season in the bullpen. Turning him into a starter would be a disaster. Let’s see him grow into an effective major league pitcher and go from there. He was extremely shaky last year….no doubt about it! At the same time….he was rushed to the Reds in 2015 with less then 200 ip in the minors. Compare that to Castillo with over 400 ip in the minors. Look at how many times he changed his mechanics last year! He’s got velocity and movement. The talent is there and he can hit, run, etc. and is a great athlete. I still believe in him, but he needs to be coached up and find something he can stick with! I agree with Alex…… I mean he wasn’t even that good as a bull pen guy I just don’t see any reason he would somehow improve with more times through the lineup. I mean with that said I guess I would give him a chance to start in the spring and if he just dominates ok I give him a chance to start in the first few months. But again like Alex said what gives anyone any idea he is going to actually turn it around. I don’t see it happening. Because he’s 26 years old, has a live arm, is athletic, and has actually pitched well for extended periods of time. All of those factors weigh in favor of the notion that he could get better and succeed as a starter. His trouble last year appear to be related to faulty mechanics. That’s something that can be fixed. With few exceptions, the Reds’ rotation is wide open for candidates. The question really is why not try him as a starter? In a trade package for that elite top tier starting pitcher. Sell him as a starter candidate with starter experience and with back end of bullpen experience. Let some other team ponder the starter/reliever question. The Reds should state that the trio of Castillo, Stephenson, and Romano are the starters going forward with Bailey. DeSclafani, if healthy has the #5 spot. Finnegan is #5 if DeSclanfani can’t go. Mahle and Lopez at AAA in case of an emergency. Lorenzen added to the starting mix just muddies the waters even more. The Reds need to start getting more clarity for the rotation. Price and Williams have both stated their preference is not to use any of 2018 for starting pitching auditions. Now if you want to use Lorenzen like how the Astros used Brad Peacock this past season, that might be the way to go if you don’t trade him. Peacock began the season in the bullpen, but went to the rotation when one of the Astros starters went to the DL. He ended with 21 starts. I would also support WVREDLEGS strategy here. He would be starting in AAA with Garrett, Mahle, and Romano. I see little sense in trying to make Lorenzen a sp unless he has at least 1 option. If so let him start the season in the Louisville rotation & see how he does. Right now he’s no better than the 8th or 9th option in the Reds 2018 rotation behind Castillo, Bailey, DeSclafani, Finnegan, Stephenson, Romano, Mahle, & perhaps Garrett. However they use Lorenzen in 2018, I see him as a trade chip long term. Depth is good! The Lorenzen from 2016 can pitch for anyone and help out. We’ll see? Its a good problem to have. They’ll have some good trade chips at some point. Personally, I don’t think Bailey is the top 5 if Disco/Finnegan can go but that’s a big if? He threw 80+ innings and is healthy. Practically speaking. ..he is 26 on opening day. Now is the time do it….give him 120 innings this year and then in 2018 he can make 28-30 starts…..his SP window is closing… If not now… he is a reliever forever. Back in the day, the Reds had a couple of workhorse relievers in Pedro Bourbon and Clay Carroll (and before that Wayne Granger). Pedro would pitch close to 120 innings over 70 some games…Carroll a little less, maybe 90 innings. Seems like the Reds could use such middle men and Lorenzen might be one of them. Also, in looking back at that stats from those days, I noted that Mario Soto took a couple of years (like 4) to become a Reds ace during the 80s…so maybe some of young pitchers will come around. Good points. “The Hawk” was amazing, and Lorenzen reminds me a little of Borbon, except for the Airplane reference: lean, good movement on his pitches. As stated above, he has mechanical issues that were discussed near the end of the year. Work those out early in ST, see how the other starting candidates shake out, and plug him in where needed. Is there really another reliable reliever besides Iglesias right now? I’m not even sure about Peralta. I would definitely give him a chance to be a starter in spring training and early in the season. However, the opportunity may come later based on injuries or unexpected poor performance of some of the other starters. This is why signing a #4 type starter this offseason doesn’t make much sense to me. We have too much sorting to do with the starting pitchers and bullpen. he seems like he puts too much pressure on himself to be a closer or late inning reliever. he has good stuff so I think he would be better as a long reliever/spot starter. I’m on board with the idea of looking to trade Lorenzen. He will be 26 years old, is a lock to be a Super2; and, they don’t have certainty where he fits in. Add in that unlike when Lorenzen was rushed to MLB several years ago, the Reds are now swimming in pitching talent. Cut the cord and let him be somebody else’s expensive enigma. Sell high…buy low if possible. Lets see how he does out of the pen next year? I’d trade him in a heartbeat (plus whatever) to Tampa for lefty Blake Snell. We really need a lefty and Garrett is all over the place and a little old to be that much of a project imo. I like Finnegan, but is he ever going to be 100%? Not up for trading him. He’s shown electric stuff before. Let’s see if it can be harnessed. I feel he’s one of the pieces going forward. Plus the fact that he works out hard and is in great shape! Its possible that he over did it, but its a sign that he’s dedicated. Getting in great shape helped Jake Arrieta turn his career around! When I watch Lorenzen pitch at times, the movement on his fastball is amazing. I can’t help but think, wow wouldn’t that be more useful in a starting role? Steve makes some very good points on his xFIP in the second half and Chad’s point of why not give him a chance at least in spring training. What is there to lose? I’m not high on this guy. I was, but his performance last year wasn’t impressive. I say 1) change his delivery. Didn’t he change his mechanics midway through last year? If I remember, after that, his stats went down. 2) If and only if he changes his mechanics to the way they were before, give him a ST chance. 3) After the many injuries pile up during ST and into May, evaluate where he is. If not on the DL, where is the best place for him based on performance to that point? If his mechanics stay as they did during the second half of last year, keep him in the pen and use him in medium to low leverage situations. I actually read the article and looked at some stats. I take back some things I said. Revision: 1) Give him a shot as a starter in ST. 2) After the many injuries pile up during ST and into May, evaluate where he is. Lorenzen will be 26 years old in 2018. He has accumulated 2 yrs and 159 days of MLB service time so he is super eligible for arbitration and is projected to make $1.4MM for 2018. Lorenzen has clearly stated his desire to start. The Reds have quasi-endorsed a willingness to give him a chance to start. 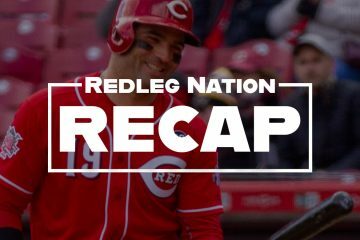 The Reds do not appear poised to move from rebuilding to competing in 2018. At least their actions and statements through the 2017 season and into the off season do not provide any indication that they are ready to compete in 2018. The Reds have a Kentucky stable full of starting pitching candidates ready to prove (or not) that they are major league ready and Lorenzen has pitched a total of 113 innings over the past 2 seasons. The Reds have mishandled Lornezen’s development (now there’s a big Red surprise!) so they have no idea what to do with Lorenzen and how he can be most effective at the major league level. Lorenzen has minimal trade value after his experimentaion episodes with his mechanics dueing the 2nd half of last season so trading Lorenzen would be selling low…again. What an absolute FUBAR mess! Lorenzen has options available and he wants to be a starter. Their are starting pitchers already lined up and stretched out to pitch at the major league level. 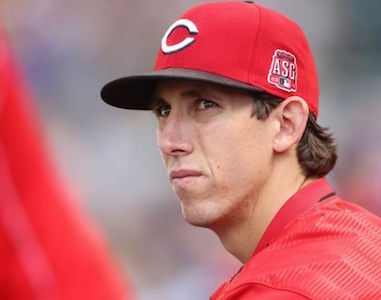 Lorenzen needs to get in line so he should join Reed, Mahle, Garrett, Stephens and Davis at Louisville to prepare and be ready for a starting opportunity to open up at the major league level. If we could trust Price to utilize Lorenzen for consistent, extended outings while working from the major league bullpen in order to extend Lorenzen out to 120 innings for 2018, I could see utilizing him in a bullpen role while preparing him to start, but that ain’t happenin with Price managing the team. Lorenzen should have been utilized for consistent, extended outings while working from the major league bullpen to extend him out to 120 innings last season, but Price was managing the team then too. When a starting opportunity opens at the major league level, the best prepared and ready starter at Louisville should get a shot at seizing the opportunity. If that happens to be Lorenzen, so be it. It that happens to be Mahle, so be it. If that happens to be Garrett, so be it. If that happens to be Reed, so be it. If that happens to be Davis, well now we’re simply talking nonsense. I would think a trade is on the horizon very soon. Something has got to give way. And that is not with Michael Lorenzen in the mix. Add him in and that is a lot of bodies for 5 spots. Some type of trade is going to happen involving a couple or a few of those listed. 9 and above are not starting options unless there are injuries or performance issues above them. I do not see #3 as an option at all because of all these names. 2018 is the 2017 year of sorting for pitching. 1,6 and 7 will probably have some sort of innings limit. We will need 2 pitchers to just finish the year. This would speak well to Lorenzen who could begin at AAA with a 3 inning limit in April, 4 inning limit in May and 5 in June or some such play to stretch him out in such a way that he is starting. That might get him to 130-140 innings and allow him to finish the year as a starter. Of course, performance and injury would trump everything, but there should be a plan in place to have Mahle and another capable starter ready for after the all star break with the big club. Scratch #3, add-in Lorenzen puts you back at a baker’s dozen. But even then, returning from injury: 14. Jon Moscot. 15. Nick Travieso. 16. Rookie Davis. And Jesus Reyes isn’t far behind either. Reds are going to need some addition by subtraction this winter. I would like to see the Reds avoid another Aroldis Chapman experience where they failed to give him enough time to see if he could be a starter. At age 26 this is now or never to see if Lorenzen can get it done as a starting pitcher beginning in spring training. Nothing to lose and it might work out which would allow money to be used for a starter to go instead toward a shortstop or centerfielder. They could always engineer a reverse Cueto trade with 3 guys going to an aging team with a weaker minor league system (16th) like Toronto with Marcus Stroman. Or another pitching rich team w/some age and a bad farm system (27th) in the Mets. Probably will have to wait until next offseason for a shot at Stroman but I think he is the real deal and would love for him to be in a Reds Uniform. The Mets, on the other hand, could be a fit. They need a 2nd baseman. How about Scooter for Zach Wheeler and Hansel Robles? I wasn’t impressed with Wheeler last year? Now he’s been hurt a lot but if Steven Matz was healthy? If Stanton goes to the Cards I’m done!! I will still follow them, but not that closely. Colts, Pacers, and Indiana fan so I can only take so much automatic losing. Just being the Washington Generals and having zero chance every year gets old. I wasn’t really either, but there were a couple of positives about him. First, he’s finally healthy and pitched a decent amount of innings (approximately 80ish). Second, he has a successful track record of pitching in the majors, granted it was a few years ago. Best case scenario, he pitches back to that form and becomes a mainstay in our rotation, possibly near the top, which is what the Reds want. If not, he could become a high leverage reliever (a la Mike Minor). If it is a complete bust, we gave up a guy who we got off the waiver wire. Well worth the risk in my opinion. The problem with the reds is they keep holding on to pitchers and players that are not good enough to play their positions, Lorenzen as far as I’m concerned is one of the problems the reds to distance themselves from!!! As long as the team is still “sorting” in 2018 (which it looks that’ll be the case), then grant him his wish and let him try to start. He has the stuff. Let’s see if he has the mentality, elbow, and grit for it. If he doesnt win a job, he can be a very good reliever and a pretty good trade chip. I think we saw the 2018 rotation at the end of 2017: Bailey, Castillo, Romano, Stephenson, Mahle. Lorenzen and everyone else in the bullpen. If there is a problem with injuries/ineffectiveness on the part of the holdover starters, others like DeSclafani and Finnegan would be in line first. I think they should use him as a pitcher. They’e got enough belly-itchers already. Get him back to his natural mechanics. Lorenzen has starter quality “stuff”. Starters are more valuable than relievers. Ergo, he should get an extended chance to start and maximize his value. Maybe that’s at AAA, maybe in Cincinnati, but to just assume he’s only useful as a reliever is a(nother) waste of resources. Yes, there are lots of,other potential starters in the system, but it’s illogical to conclude that Lorenzen will not be one of the best five (or, more practically, seven or so) starters without an actual extended tryout. Give him a shot and do this sorting thing properly. Lorenzen did get an extended chance to start, back in 2015. He started 21 games for the Reds & had only 7 quality starts. His 2015 ERA was 5.40 with a 1.66 WHIP. He’s been in the ML for about 3 years now & his career ERA is still north of 4.5. Everybody says he has great stuff, but ML hitters haven’t gotten that memo. ML & the Reds are better off with him in the bullpen to start 2018. Once again…he was rushed to the majors in 2015. Castillo had over twice as many innings in the minors. Same with Romano. I also wouldn’t say he was smacked around exactly? He allowed a .224 batting average in 2016 and .244 last year with only 14 HRs allowed in 133 total ip. That’s a lower HR rate then Castillo’s! We don’t want to repeat Baltimore’s situation with Jake Arrieta where they gave up on him. At the same time…he’s behind a lot of guys as a starter so we’ll see? 2018 is another year of sorting, so hopefully they can start to put the pieces together? He’s also not the same pitcher now that he was then. He has 2 pitches he didn’t even have back then (sinker, cutter). You are right Indy.A few early starts in 2018 would help as Steve said.Saying he is a reliever would be a mistake.If they traded him tomorrow that team would start him a bunch at some level until he proved he couldn’t. Not sure if Lorenzen can be a starter or not but I agree with what most the editors said. The Reds need to see if he can be a starter. The only way to do that is to try it. If it doesn’t work out, they should be able to move him to the pen. I’m not as worried as some about his 2nd half performance or performance in general either. I think the dropoff from reliever to starter will be less extreme with him. He threw 4 pitches as a reliever. So, he basically pitched like a starter would. He’ll lose 2-3 mph off his fastball but that actually may help his sinker sink. 2018 will be more sorting (#Rebuildbinder) unfortunately. So, the Reds should go ahead and sort him into SP or RP once and for all. I agree with all of you. Lorenzen has the stuff to be a major league starter, at least as much of a chance as anyone else currently wearing a Reds uniform for that matter. The biggest hurdle for him will be the mental side, because he certainly has the physical pedigree to do it well. His problem with homers in the second half had to do with locating his fastball early in the count, usually to the first or second batter he would face and the opposition knew it. Staying out of the belt high down Broadway fastball is key because his is straight as an arrow until he gets comfortable. If Lorenzen gets some late action on that thing he will be a nightmare to hit. The fact that he desires to be a starter may just be the thing that locks him in. Should the chance not work out, I bet he will be a better reliever anyhow because as long as he has his shot, he won’t have that idea floating around in the back of his mind anymore. I however am rooting for it to work because he can be really really good when he is on.